Sir David Brewster, (11 December 1781 - 10 February 1868) was a Scottish scientist. His most important subjects of inquiry fall under five headings: (1) The laws of polarization by reflection and refraction, and other quantitative laws of phenomena; (2) The discovery of the polarizing structure induced by heat and pressure; (3) The discovery of crystals with two axes of double refraction, and many of the laws of their phenomena, including the connection between optical structure and crystalline forms; (4) The laws of metallic reflection; (5) Experiments on the absorption of light. In this line of investigation the prime importance belongs to the discovery (1) of the connection between the refractive index and the polarizing angle, (2) of biaxial crystals, and (3) of the production of double refraction by irregular heating. Annie Jump Cannon (11 December 1863 - 13 April 1941) was a US astronomer. Working on what would be published as the Henry Draper Catalogue, Cannon catalogued about 400,000 stars and ordered them into stellar spectra of types O, B, A, F, G, K, M. Cannon had noticed that stellar temperature was the main distinguishing feature among the different spectra, so she combined the previous classification systems used at the observatory into a simplified system. She reordered the previous types by temperature and eliminated most of the spectral class types because they became redundant. Unlike previous classification systems, Cannon's system related the amount of hydrogen observed to a physical property of the stars. This classification inspired the mnemonic phrase "Oh, Be A Fine Girl - Kiss Me!" still taught to astronomy students today to remember that particular order. Guglielmo Marconi received the first trans-Atlantic radio signal, sent from Cornwall, England to Newfoundland, Canada, 2232 miles away. J. H. Metcalf discovered asteroid #691 Lehigh. G. Kulin discovered asteroid #1436 Salonta. Leslie John Comrie (15 August 1893 - 11 December 1950), born in Pukekohe, New Zealand, was an astronomer and a pioneer in mechanical computation. During World War I, he lost a leg fighting in France with the New Zealand Expeditionary Force. While convalescing, he started using a mechanical calculator and went on to modifying commercial calculators for specific projects. In April 1928 his article On the Construction of Tables by Interpolation described the use of punch card equipment for interpolating tables of data, comparing this with the less efficient and more error-prone methods using mechanical calculators. Also in 1928, he was the first to use punch card equipment for scientific calculations, using Fourier synthesis to compute the principal terms in the motion of the Moon for 1935 to 2000. The supersonic transport Concorde, developed by the British and French, was first publicly shown, in Toulouse, France. NASA's Apollo 17 landed on the Moon, the last manned landing there to date (2018). NASA launched the Mars '98 Orbiter (also called the Mars Climate Orbiter) toward Mars, which later burned up in the Martian atmosphere. The Mars Climate Orbiter (formerly called the Mars Surveyor '98 Orbiter), launched 11 December 1998, was one of two separately launched spacecraft comprising the Mars Surveyor '98 program (the other craft being the Mars Polar Lander). The two missions were to study the Martian weather, climate, and water and carbon dioxide budget, in order to understand the reservoirs, behavior, and atmospheric role of volatiles and to search for evidence of long-term and episodic climate changes. 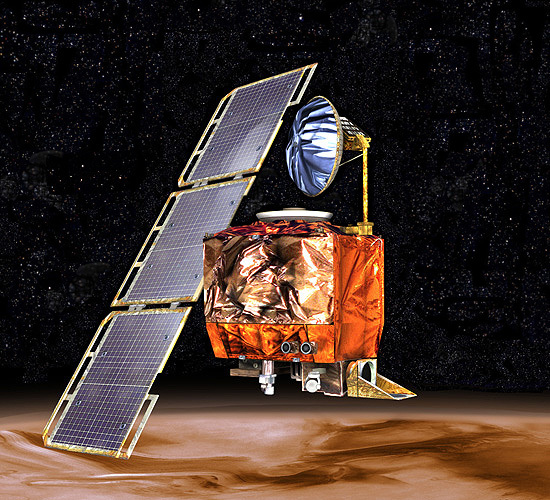 The Mars Climate Orbiter was destroyed when a navigation error caused it to miss its target altiude at Mars by 80 to 90 km, instead entering the Martian atmosphere at an altitude of 57 km during the orbit insertion maneuver on 23 September 1999. The Orbiter had as its primary science objectives to: 1) monitor the daily weather and atmospheric conditions; 2) record changes on the Martian surface due to wind and other atmospheric effects; 3) determine temperature profiles of the atmosphere; 4) monitor the water vapor and dust content of the atmosphere and 5) look for evidence of past climate change. Mars Climate Orbiter was launched on a Delta 7425 (a Delta II Lite launch vehicle with four strap-on solid-rocket boosters and a Star 48 (PAM-D) third stage) from Pad A of Launch Complex 17 at Cape Canaveral Air Station, Florida. After a brief cruise in Earth orbit, the Delta II third stage put the spacecraft into trans-Mars trajectory. About 15 days after launch the largest trajectory correction maneuver (TCM) was executed using the hydrazine thrusters. During cruise to Mars, three additional TCM's using the hydrazine thrusters were performed on 4 March, 25 July, and 15 September 1999. The spacecraft reached Mars and executed a 16 minute 23 second orbit insertion main engine burn on 23 September 1999 at 09:01 UT (5:01 AM EDT) Earth received time (ERT, signal travel time from Mars was 10 minutes 55 seconds). The spacecraft passed behind Mars at 09:06 UT ERT and was to re-emerge and establish radio contact with Earth at 09:27 UT ERT, 10 minutes after the burn was completed. However, contact was never re-established and no signal was ever received from the spacecraft. Findings of the failure review board indicate that a navigation error resulted from some spacecraft commands being sent in English units instead of being converted to metric. This caused the spacecraft to miss its intended 140 - 150 km altitude above Mars during orbit insertion, instead entering the Martian atmosphere at about 57 km. The spacecraft would have been destroyed by atmospheric stresses and friction at such a low altitude. The burn would have slowed the spacecraft and put it into a 14 hour elliptical (~150 x 21,000 km) capture orbit. The orbiter was to begin aerobraking, using the solar panel to provide resistance and continue until a 90 x 405 km orbit was achieved, nominally on 22 November 1999, with periapsis at 89 N. The hydrazine thrusters would be used to change the orbit to a 2-hour, 421 km near-circular polar science mapping orbit on 1 December 1999. The orbit was to be nearly Sun-synchronous, crossing the daytime equator at about 4:30 PM local time. The first phase of the mission was to support the Mars Polar Lander from its landing on Mars on 3 December 1999 to the end of the lander primary mission on 29 February 2000. The orbiter would pass over the lander site 10 times per Martian day for 5-6 minutes each time, communicating via the UHF 2-way relay link at 128 kbits/s. Mars science operations and mapping, involving operation of the MARCI and PMIRR, would initiate on 3 March 2000 and continue for one Martian year (687 days). At the end of the mapping mission on 15 January 2002, the orbiter was to be placed in a stable orbit and function as a UHF relay for the Mars 2001 mission. STS 97 was launched 30 November 2000, carrying the P6 Integrated Truss Segment to the International Space Station. During its 11-day mission, the crew of Endeavour saw the International Space Station spread its wings -- giant solar arrays that quintupled the station's electrical power. The 73 meter (240 foot) by 11.6 meter (38 foot) solar array structure - attached and unfolded by Endeavour's international crew of five - is the longest human-made object ever to fly in space. Endeavour carried aloft the U.S.-developed solar arrays, associated electronics, batteries, cooling radiator and support structure. The entire 15.4 metric ton (17 English ton) package is called the P6 Integrated Truss Segment, and was the heaviest and largest element delivered up to that time to the station aboard a space shuttle. The addition of the huge solar arrays clearly distinguishes the International Space Station from any predecessor spacecraft. The arrays provide the station with more electrical power than anything that has flown before. Endeavour also was the first space shuttle to visit an inhabited International Space Station. Endeavor docked at the ISS on 2 December 2000 at 2 p.m. CST, and undocked 9 December 2000 at 1:13 p.m. CST. It landed on 11 December 2000 at 5:03 p.m. CST after a mission of 10 days, 19 hours, 57 minutes. Orbit altitude: 177 nautical miles. Orbit inclination: 51.6 degrees. Miles traveled: 4.476 million. The crew of STS 97 was: Brent Jett, Commander; Michael Bloomfield, Pilot; Marc Garneau, Mission Specialist; Carlos Noriega, Mission Specialist; Joseph Tanner, Mission Specialist.